The conjugative plasmid R388 and a number of other plasmids carry an operon, stbABC, adjacent to the origin of conjugative transfer. We investigated the role of the stbA, stbB, and stbC genes. Deletion of stbA affected both conjugation and stability. It led to a 50-fold increase in R388 transfer frequency, as well as to high plasmid loss. In contrast, deletion of stbB abolished conjugation but provoked no change in plasmid stability. Deletion of stbC showed no effect, neither in conjugation nor in stability. Deletion of the entire stb operon had no effect on conjugation, which remained as in the wild-type plasmid, but led to a plasmid loss phenotype similar to that of the R388ΔstbA mutant. We concluded that StbA is required for plasmid stability and that StbA and StbB control conjugation. We next observed the intracellular positioning of R388 DNA molecules and showed that they localize as discrete foci evenly distributed in live Escherichia coli cells. Plasmid instability of the R388ΔΔstbA mutant correlated with aberrant localization of the plasmid DNA molecules as clusters, either at one cell pole, at both poles, or at the cell center. In contrast, plasmid molecules in the R388ΔΔstbB mutant were mostly excluded from the cell poles. Thus, results indicate that defects in both plasmid maintenance and transfer are a consequence of variations in the intracellular positioning of plasmid DNA. We propose that StbA and StbB constitute an atypical plasmid stabilization system that reconciles two modes of plasmid R388 physiology: a maintenance mode (replication and segregation) and a propagation mode (conjugation). The consequences of this novel concept in plasmid physiology will be discussed. The ability of bacteria to evolve and adapt to new environments most often results from the acquisition of new genes by horizontal transfer. Plasmids have a preponderant role in gene exchanges through their ability to transfer DNA by conjugation, a process that transports DNA between bacteria. Besides, plasmids are autonomous DNA molecules that are faithfully transmitted to cell progeny during vegetative cell multiplication. In this study, we report a system composed of two proteins, StbA and StbB, which act to balance plasmid R388 physiology between two modes: a maintenance mode (vertical transmission) and a propagation mode (horizontal transmission). We demonstrate that StbA is essential to ensure faithful assortment of plasmid copies to daughter cells. In turn, StbB is required for plasmid R388 adequate localization for conjugation. This is the first report of a system which reconciles plasmid segregation and conjugation. Furthermore, R388 belongs to the IncW family of conjugative plasmids, which are of particular interest due to their exceptionally broad host range. We show that the StbAB system is conserved among a wide variety of conjugative plasmids, mainly broad host range plasmids. Thus, the Stb system could constitute an interesting therapeutic target to prevent the spread of adaptive genes. Alejandro Peña, Jorge Ripoll-Rozada, Sandra Zunzunegui, Elena Cabezón, Fernando de la Cruz & Ignacio Arechaga. Type IV secretion systems (T4SS) mediate the transfer of DNA and protein substrates to target cells. TrwK, encoded by the conjugative plasmid R388, is a member of the VirB4 family, comprising the largest and most conserved proteins of T4SS. In a previous work we demonstrated that TrwK is able to hydrolyze ATP. Here, based on the structural homology of VirB4 proteins with the DNA-pumping ATPase TrwB coupling protein, we generated a series of variants of TrwK where fragments of the C-terminal domain were sequentially truncated. Surprisingly, the in vitro ATPase activity of these TrwK variants was much higher than that of the wild type enzyme. Moreover, addition of a synthetic peptide containing the amino acid residues comprising this C-terminal region resulted in the specific inhibition of the TrwK variants lacking such domain. These results indicate that the C-terminal end of TrwK plays an important regulatory role in the functioning of the T4SS. Curiao T, Canton R., Garcillán-Barcia M.P., de la Cruz F., Baquero F., Coque T.M. The association of an IS440-sul3 platform with Tn21 class 1 integrons carried by IncI1 plasmids encoding extended-spectrum β-lactamases (ESBLs; mainly SHV-12 and CTX-M-14) among worldwide Escherichia coli clones of phylogroups A (ST10, ST23, and ST46), B1 (ST155, ST351, and ST359), and D/B2 (ST131) is reported. An in silico comparative analysis of sul3 elements available in the GenBank database shows the evolution of sul3 platforms by hosting different transposable elements facilitating the potential genesis of IS26 composite transposons and further insertion element-mediated promoted arrangements. El próximo día 19 de Mayo a las 19:00h, en el Paraninfo de la Universidad de Cantabria, tendrá lugar el acto de investidura de Mariano Barbacid como Doctor Honoris Causa por la Universidad de Cantabria, a propuesta del Instituto de Biomedicina y Biotecnología de Cantabria (IBBTEC). El día 20 de Mayo impartirá una Conferencia Plenaria en la Facultad de Medicina. Mariano Barbacid was born in Madrid in 1949. He was awarded his PhD degree from the Universidad Complutense de Madrid in 1974. From 1974 – 1978 he trained as a Postdoctoral Fellow at the National Cancer Institute (NCI), Bethesda, Maryland, USA. In 1978 he set up his own group to work on the molecular biology of human tumours. His work led to the isolation of the first human oncogene, H-Ras, in 1982. Other contributions of special relevance include the identification of Ras oncogenes as targets of chemical carcinogens (1984), the discovery of the Trk family of tyrosine kinase receptors as the signalling receptors for the NGF family of neurotrophic factors (1991) and the physiological role of the cell cycle Cdks (2003 – 2007). He moved to the NCI campus in Frederick, Maryland (USA), as Head of the Developmental Oncology Section in 1984. In 1988, he joined the Bristol Myers-Squibb Pharmaceutical Research Institute in Princeton, New Jersey where he became Vice President of Oncology Drug Discovery. In 1998 he returned to Madrid to create and direct the CNIO (see Commentary in Cell, 129: 641-644, 2007). Mariano Barbacid has authored 245 publications including 176 original articles and 24 invited reviews in refereed journals as well as 45 book chapters. The average impact factor of the 200 publications published in peer-reviewed journals is >12. His current Hirsch “h” factor is 86. The relevance of his work has been recognised through several awards including the Young Investigator Award of the AACR (1986), the Steiner Prize (1988), the Ipsen Prize (1994), The Jimenez Díaz Award (2002), the Brupbacher Cancer Research Prize (2005), and the Medal of Honour of the International Agency for Research on Cancer (WHO) in 2007. He has been an EMBO Member since 1996. Gabriel Moncalián fluye del razonamiento científico a lo que aún solo puede considerarse ciencia ficción, «pero que está ahí, es factible». Probablemente se sirve de una explicación tan libre para dar masticado un mensaje complicado, el de su último estudio. La revista científica 'Nature Structural and Molecular Biology' lo publicó hace una semana. Es un artículo sobre la reparación de ADN firmado por un equipo de investigadores del que forma parte y que desarrolla como miembro del Instituto de Biomedicina y Biotecnología de Cantabria (Ibbtec). -Vamos por partes. Nosotros lo que hacemos es desentrañar la estructura de ciertas proteínas por el método de cristalización, a través de una técnica que utiliza la difracción de rayos X. Eso nos lleva a conocer su morfología, el modo en que funcionan y cómo interactúan con otras moléculas para efectuar la reparación de ADN en la reproducción celular. -Cuando las células reciben, por ejemplo, radiación ultravioleta, se mueren células, el ADN se daña, y lo que hace el cuerpo es reponerlas. El ADN debe ser reparado para incluirlo en las nuevas células y en ese proceso intervienen proteínas específicas. Nuestro estudio se centra en esas particularidades y nos puede servir para analizar el proceso en sí y también para dar respuesta a otras preguntas. -Conocer el modo en que se puede atacar la reproducción indiscriminada de un cáncer puede resultar muy útil. En la actualidad existen muchos tratamientos que matan esas células dañinas. Pero aquí lo importante es que no puedan reproducirse transmitiendo ese ADN corrupto. Si logramos eso incidiendo con inhibidores sobre las proteínas que permiten esa transmisión de información genética, los tratamientos podrían ser combinados y más efectivos. -Nosotros somos los primeros en querer que la ciencia básica que hacemos sea de rápida aplicación, pero es más complicado. Incluso encontrando un inhibidor adecuado, hacen falta de diez a quince años para el desarrollo y unos 100 millones de dólares de inversión. -Hay genes asociados a determinados tipos de cánceres. Un médico puede saber que alguien, antes de nacer, tiene más predisposición a sufrir cáncer de mama, por ejemplo, porque tiene una mutación en un gen específico. Por eso se habla de ciertos niños que han sido curados, antes de nacer, de una enfermedad congénita. -Hay ilusión y miedo en toda la comunidad científica cántabra dedicada a esto por el temor de que la crisis económica conduzca a un recorte de gasto que impida terminar bien un proyecto ambicioso. Sería una pena quedarnos a muy poco de hacer realidad un sueño tan deseable. Esperamos que no pase. -El envejecimiento es un proceso natural y beneficioso que permite la evolución natural. Si lo evitáramos, nos conduciríamos hacia un mundo superpoblado o estancado en la evolución de nuestra especie. -Es perfectamente factible, sí. Podríamos perfeccionar la reparación celular y solucionarlo, aunque no sabemos qué consecuencias tendría. -Conocemos bien el funcionamiento biológico del cuerpo; pero desconocemos mucho del funcionamiento del cerebro, del mecanismo que mueve la memoria. Si viviéramos 1000 años, cosa que podría lograrse si reparáramos continuamente el ADN de alguien, no sabemos cómo reaccionaría su cerebro. Podría colapsar, podríamos terminar con la sociedad. Pero no soy experto en nada de esto, es solo una opinión personal. Esto se sale un poco del estudio. La prestigiosa revista científica “Nature Structural and Molecular Biology” (NSMB) publica, en su edición digital, un artículo sobre la reparación del ADN que está firmado por varios investigadores, entre ellos el profesor de Genética de la Universidad de Cantabria Gabriel Moncalián Montes. 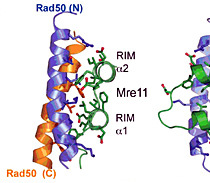 Titulado “ABC ATPase signature helices in Rad50 link its nucleotide state to the Mre11 interface for DNA double-strand break repair” doi:10.1038/nsmb.2038, el texto de investigación describe cómo se produce la interacción entre las proteínas Mre11 y Rad50 y su implicación en la reparación de ADN con roturas en la doble cadena. La publicación tiene uno de los índices de impacto más elevado de entre las revistas especializadas que cubren las disciplinas de biofísica. Ambas proteínas participan en la conexión y alineamiento de los extremos del ADN cortado de forma coordinada gracias a la interacción observada por primera vez en las estructuras descritas en el artículo de NSMB. Así, estos resultados podrían tener gran importancia en el desarrollo de pequeñas moléculas que eviten esta interacción, haciendo que las células cancerosas sean más sensibles al tratamiento tradicional al inhibir las rutas de reparación del ADN dañado. 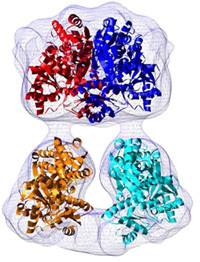 La estructura tridimensional del complejo Rad50-Mre11 fue resuelta por Gabriel Moncalián durante su estancia posdoctoral en el laboratorio del doctor John Tainer en el Instituto Scripps de La Jolla (California, Estados Unidos) y en los sincrotrones de Berkeley y Stanford, también en California. Para ello utilizó la técnica de difracción de rayos X de cristales de proteína, principal método de obtención de información estructural en el estudio de proteínas. Moncalián usó radiación de rayos X producida en un sincrotrón (acelerador de electrones) debido a su alta intensidad y posibilidad de modificar su longitud de onda. Actualmente, Gabriel Moncalián es el investigador principal del sub-grupo de investigación “Ingeniería de Proteínas” en el Instituto de Biomedicina y Biotecnología de Cantabria (IBBTEC), donde continúa realizando estudios de estructura de proteínas, utilizando para ello el soporte científico del sincrotrón europeo ESRF de Grenoble (Francia). El grupo de I+D+i está estudiando actualmente la modificación de dos tipos de proteínas, las de unión a ADN y las implicadas en la síntesis de triglicéridos), para ampliar el conocimiento de sus mecanismos de acción y modificar su función con fines biotecnológicos. 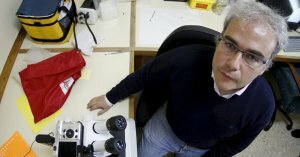 Para la ingeniería de proteínas de unión a ADN, el equipo de Moncalián trabaja en colaboración con el doctor Fernando de la Cruz, también del IBBTEC, en la modificación de diversas proteínas que controlan el paso de información genética de una célula a otra. En cuanto a la ingeniería de proteínas de síntesis de triglicéridos, el grupo está estudiando las diacilgliceroltransferasas de diversos organismos para modificar la composición final de triglicéridos de estos organismos, gracias a un proyecto de investigación financiado por el Ministerio de Ciencia e Innovación. Además, Gabriel Moncalián continúa implicado en el estudio de la reparación de roturas de ADN de doble cadena en colaboración con el grupo del doctor Tainer. En mayo de este año comenzará una estancia de tres meses en el laboratorio del Instituto Scripps para caracterizar estructuralmente otra de las proteínas implicadas en la reparación del ADN. Ante las dificultades de cristalizar el enzima fosfofructokinasa de músculo humano para obtener su estructura tridimensional mediante difracción de rayos X, investigadores del Departamento de Bioquímica de la Universidad Autónoma de Madrid (UAM), el Instituto de Investigaciones Biomédicas Alberto Sols (UAM-CSIC) y el Centro Nacional de Biotecnología (CNB) han analizado esta proteína mediante microscopia electrónica, encontrándose con una estructura inesperada. La fosfofructokinasa (PFK) es un enzima cuya actividad es esencial para controlar el consumo de glucosa en la generalidad de los organismos vivos. Esto es posible a través de una serie de mecanismos de regulación cuya base estructural se ha establecido en bacterias, pero no en mamíferos, donde este enzima posee un grado de complejidad considerablemente superior y aún se carece de datos de cristalografía de rayos X. En un reciente artículo publicado en The FASEB Journal, los investigadores Ignacio Arechaga, Oscar H. Martínez-Costa, Cristina Ferreras, José L. Carrascosa y Juan J. Aragón han examinado la estructura de PFK de músculo en presencia del substrato fructosa 6-P a través de microscopia electrónica (ME) a una resolución de 1,8 nm, representando la primera reconstrucción tridimensional de una PFK de mamíferos. El volumen reconstituido de PFK-M corresponde a una molécula alargada con cuatro subunidades de idéntica secuencia aminoacídica, un homotetrámero, que se organiza en dos dímeros. El análisis de las imágenes y la reconstrucción tridimensional mostraron que, sorprendentemente, uno de los dímeros contiene un llamativo canal central que está ausente en el dímero opuesto. En consecuencia, el tetrámero posee un tipo de simetría, C2 a lo largo de su eje mayor, diferente de la simetría D2 asumida hasta ahora. La estructura revela, pues, que ambos dímeros se encuentran en conformaciones marcadamente diferentes: abierta en el que posee la cavidad central y cerrada en el adyacente, lo que constituye una estructura tridimensional poco común. El ajuste de la estructura atómica del enzima de bacterias en el modelo obtenido por ME ha sugerido que solamente el dímero en conformación cerrada puede contener sitios catalíticos para unir normalmente el substrato fructosa 6-P y sitios de unión para el regulador fructosa 2,6-P2, mientras que esos sitios no parecen ser funcionales en el dímero en conformación abierta debido a la amplia separación impuesta por el canal central. La estructura encontrada puede tener, por tanto, implicaciones de gran trascendencia para la función de este enzima en la regulación del metabolismo energético de mamíferos. El Parque Científico y Tecnológico será también el emplazamiento del Instituto de Biomedicina y Biotecnología de Cantabria (Ibbtec), cuya construcción, a cargo del Centro Superior de Investigaciones Científicas (CSIC), avanza en la zona oeste del parque. Dos centenares de profesionales y 25 grupos de investigación integrarán este organismo que nace con el objetivo de contribuir al avance de la investigación y del desarrollo tecnológico en materia de Biomedicina y Biotecnología con una dimensión internacional. Asimismo, desde el instituto se promoverá la cooperación con el sector industrial, desarrollando los servicios y mecanismos de transferencia de tecnología precisos para ello. Las áreas de investigación que desarrollará son las de la biología del desarrollo, neurobiología, señalización molecular, microbiología molecular y genómica y biocomputación. El edificio, que se proyecta como un cubo perforado de color blanco irisado, tendrá una superficie construida de 5.611,28 m2, repartidos entre el sótano, que albergará los almacenes, laboratorios y estabulario, y tres plantas sobre rasante, en las que se distribuirán los laboratorios generales y de apoyo. La planta baja se destinará al área de relación con las empresas, salón de actos, administración, dirección y área de descanso. En una parcela próxima a la del Ibbtec se levanta el edificio Salia, que en un futuro próximo contará con un volumen semejante en diseño, superficie y características, ya conocido como Bisalia. Ambos están promovidos por el Pctcan y su uso será principalmente de oficinas –para venta o alquiler de empresas–. Consta de cinco plantas más el sótano, con una superficie total construida de 4.989,84 m2. La diferenciación entre ambos vendrá determinada por el color de sus alzados Este y Oeste, donde están proyectadas fachadas ventiladas tradicionales revestidas con placas de resina termoendurecibles –naranjas en un caso y verde en el otro–. El objetivo del diseño elegido es dotar a estas instalaciones de una imagen propia, acorde con el uso tecnológico que albergan, así como priorizar los aspectos funcionales, de modularidad y flexibilidad de uso. Simpler biological systems should be easier to understand and to engineer towards pre-defined goals. One way to achieve biological simplicity is through genome minimization. Here we looked for genomic islands in the fresh water cyanobacteria Synechococcus elongatus PCC 7942 (genome size 2.7 Mb) that could be used as targets for deletion. We also looked for conserved genes that might be essential for cell survival. By using a combination of methods we identified 170 xenologs, 136 ORFans and 1401 core genes in the genome of S. elongatus PCC 7942. These represent 6.5%, 5.2% and 53.6% of the annotated genes respectively. We considered that genes in genomic islands could be found if they showed a combination of: a) unusual G+C content; b) unusual phylogenetic similarity; and/or c) a small number of the highly iterated palindrome 1 (HIP1) motif plus an unusual codon usage. The origin of the largest genomic island by horizontal gene transfer (HGT) could be corroborated by lack of coverage among metagenomic sequences from a fresh water microbialite. Evidence is also presented that xenologous genes tend to cluster in operons. Interestingly, most genes coding for proteins with a diguanylate cyclase domain are predicted to be xenologs, suggesting a role for horizontal gene transfer in the evolution of Synechococcus sensory systems. Our estimates of genomic islands in PCC 7942 are larger than those predicted by other published methods like SIGI-HMM. Our results set a guide to non-essential genes in S. elongatus PCC 7942 indicating a path towards the engineering of a model photoautotrophic bacterial cell. Panorama Cantabria. El Diario Montañés. 22.02.11. Hace tan solo tres años que se puso en funcionamiento el Instituto de Biomedicina y Biotecnología de Cantabria. Un periodo corto pero en el que, bajo la dirección de Ángel Pazos, ya se ha realizado una actividad investigadora «relevante tanto desde el punto de vista científico como desde el prisma de la colaboración». - El Ibbtec es un instituto reciente, ¿qué necesidades impulsaron su creación? - Más que una necesidad, se trató de la conjunción de una serie de esfuerzos que acabaron cristalizando en esta iniciativa. Por una parte, en la Universidad de Cantabria, existe, desde hace bastantes años, un número importante de grupos de Investigación y Desarrollo (I+D) que realizan una labor de nivel internacional en el área biológica, fundamentalmente en la Facultad de Medicina. Por la otra, el Consejo Superior de Investigaciones Científicas (CSIC) estaba estudiando sus posibilidades de expansión en Cantabria y detectó un nicho de calidad en nuestra área. Finalmente, el Gobierno regional identificó la biomedicina y la biotecnología como una de las áreas de claro interés desde el punto de vista de estrategias de innovación. La confluencia de todos estos intereses hizo posible la creación del instituto. - ¿Cuáles son los objetivos que persigue el centro? - De forma muy simplificada, podemos decir que existen dos objetivos, bastante complementarios: desarrollar una investigación básica de calidad internacional en una serie de áreas de la biología y lograr que los resultados de esa investigación se transfieran al mercado productivo, en forma de colaboraciones con empresas, patentes, etc. - ¿Cómo calificaría el trabajo realizado a lo largo de estos años de experiencia? - Hay que tener en cuenta que la labor fundamental de estos primeros años ha sido la de poner en marcha el instituto: organizarlo como tal, dotarse del equipamiento fundamental, llevar a cabo todo el proceso de construcción de su sede definitiva en el Parque Científico y Tecnológico de Cantabria (Pctcán) y recibir e instalar a los primeros investigadores del CSIC que se han incorporado al instituto, todo ello a la espera de contar con el nuevo edificio hoy en construcción. Hasta ese momento estamos instalados en la Facultad de Medicina, a la que, por cierto, debo agradecer el enorme apoyo recibido. En todo caso, la actividad investigadora de los grupos del instituto ha sido ya relevante en esta etapa inicial, tanto desde el punto de vista científico, publicando numerosos artículos, algunos de ellos en revistas de impacto mundial, como desde el prisma de la colaboración con empresas y actividades de transferencia e innovación. En conjunto, creo que el trabajo de estos primeros años ha sido intenso y prometedor. - ¿Cuáles diría que son los principales hitos que han alcanzado hasta ahora? - De forma realista, el hito fundamental de estos primeros años era, ni más ni menos, empezar a dar forma al instituto como tal. Dotarnos de un plan estratégico que nos permitiera trabajar sobre la base de una serie de prioridades. Eso ya lo hemos hecho. En todo caso, a pesar de la muy corta trayectoria del instituto, hemos desarrollado investigaciones importantes en sus áreas fundamentales de trabajo: cáncer, microbiología y enfermedades infecciosas, sistema nervioso, biología del desarrollo y sistema inmune. Hemos publicado varios artículos en las mejores revistas del mundo y estamos aumentando nuestro potencial de colaboración con empresas del sector. - Está previsto que en el último trimestre de este año se inauguren las nuevas instalaciones del instituto en el Pctcán, ¿qué cree que supondrán para su actividad, tanto técnicamente como en cuanto al clima laboral? - La puesta en marcha del nuevo edificio será fundamental. Por una parte, porque dispondremos de unas instalaciones modernas, amplios espacios de trabajo y una serie de equipamientos punteros en un edificio propio, lo que facilitará el funcionamiento como centro. Por la otra, estar en el entorno del Parque Científico y Tecnológico acentuará nuestras posibilidades para llevar a cabo actividades de transferencia de tecnología, sin renunciar en absoluto a la vertiente más investigadora que nos da nuestra pertenencia a la Universidad y al CSIC. Además, el nuevo edificio nos va a permitir poner en marcha la Unidad de Diagnóstico y Evaluación Biológica, un área del instituto dedicada de forma específica a la colaboración con empresas e innovación tecnológica. - El Ibbtec es un centro mixto de la UC y el CSIC, ¿qué significa para el centro este vínculo con el Consejo? - El Consejo es el instrumento fundamental del Estado para llevar a cabo investigación e innovación, siendo, por tanto, la institución más importante y potente para realizar actividades de I+D en España. Que el Ibbtec sea parte del CSIC (siendo uno de los dos únicos institutos que tiene en Cantabria, junto con el IFCA) es, por un lado, muestra del interés de nuestro trabajo y, por el otro, nos garantiza una serie de recursos y apoyo científico. De hecho, es el CSIC el que está llevando a cabo la construcción del edificio. - ¿Cuántas personas trabajan en el instituto? - Cuando el instituto esté funcionando a pleno rendimiento en su nueva sede, trabajarán en él alrededor de doscientas personas. En el momento actual, dada la situación provisional en la que estamos, somos alrededor de noventa personas, distribuidas en diez grupos de investigación, además de tres personas de administración y servicios. De esos diez grupos, cinco están dirigidos por investigadores de la UC y los otros cinco por investigadores del CSIC. Aproximadamente, una veintena somos profesores investigadores de plantilla, cerca de 50 entre investigadores doctores y becarios, y el resto son técnicos. - ¿Cuáles son sus vías de financiación? - Hay que diferenciar entre el presupuesto inicial de puesta en marcha del instituto, los gastos generales de mantenimiento y la financiación de toda la actividad investigadora y de innovación. Por lo que respecta a la puesta en marcha (parcela y construcción del edificio, equipamiento, mobiliario, etc. ), el convenio de creación contemplaba un presupuesto inicial de 13 millones de euros, entre las tres instituciones a las que pertenece: CSIC, UC y Gobierno autónomo, actualmente a través de Sodercán. Probablemente las necesidades totales de equipamiento hagan que esa cifra se eleve finalmente hasta alrededor de los 16 millones. El mantenimiento general del instituto correrá a cargo de las tres instituciones. Todo ello sin tener en cuenta el personal de plantilla, pagado lógicamente por la UC y el CSIC. Pero la investigación de todos los grupos se lleva a cabo mediante los fondos que los propios grupos consiguen en convocatorias públicas o privadas, nacionales e internacionales, o mediante contratos con empresas. Sin entrar en mucho detalle, los grupos que trabajan actualmente en el instituto consiguen por término medio cerca de 2 millones de euros anuales en este concepto. Estimamos que cuando el instituto esté trabajando a pleno rendimiento, con alrededor de 20 grupos independientes, esta cifra se elevará a más de 4 millones. - Y a nivel nacional e internacional, ¿colaboran con alguna institución? - En el ámbito nacional, los grupos del Ibbtec mantienen varias colaboraciones con grupos de otras universidades, así como con otros institutos del CSIC. Internacionalmente, mantenemos contactos con universidades y centro de investigación británicos, estadounidenses franceses y suizos, entre otros. También es importante reseñar la existencia de una amplia variedad de contratos con diversas empresas farmacéuticas y biotecnológicas de capital nacional y extranjero. Las colaboraciones con el grupo Zeltia, Progenika o FaesFarma son solo algunos ejemplos. -¿Qué retos o proyectos tienen para el futuro? - El reto fundamental es consolidar el instituto, una vez que estemos en el nuevo edificio. Esta consolidación pasa por la incorporación de nuevos grupos e investigadores de nivel internacional, tanto a través del CSIC como de la propia Universidad. Hay ya tres grupos del CSIC seleccionados para trasladarse al instituto en cuanto el edificio esté operativo. Por otro lado, el proyecto Campus de Excelencia Internacional va a permitir atraer a investigadores de alto prestigio. Este proceso de consolidación debe permitirnos, a pesar del difícil momento económico que atravesamos, mantener y mejorar la calidad científica de nuestro trabajo, por un lado, y aumentar nuestra actividad de innovación aplicada y transferencia al sector productivo. -¿Una definición, sencilla, sobre lo que hace el Ibbtec? - El IBBTEC pretende realizar una investigación que ayude a resolver los interrogantes importantes relacionados con las bases biológicas de las enfermedades, así como potenciar las aplicaciones de la biología en sectores como el farmacéutico, el alimentario o el energético, entre otros. Una parte de su trabajo debe plasmarse en resultados que sean transferibles al mercado. - Quizás la biomedicina y la biotecnología suenan a palabras mayores, ¿cree que la ciudadanía entiende lo que hacen o perciben su actividad? - Creo que es posible que se perciba en parte como algo similar a la actividad médica que se lleva a cabo en los hospitales. En todo caso, es bueno aclarar que la biomedicina se refiere a al conocimiento y la investigación en áreas relevantes para la salud, especialmente la humana, mientras que con la biotecnología nos referimos a las aplicaciones tecnológicas que usan sistemas biológicos u organismos vivos para crear o modificar procesos: ya se ve que esto trasciende al área de salud y también abarca agricultura, aplicaciones industriales, energía, etc. Obviamente, toda la parte de nuestro trabajo enfocada hacia la medicina y la salud debe estar lo más estrechamente vinculada que sea posible a la actividad clínica. Por eso, es importante decir que el Ibbtec tiene una clara vocación de compartir e intercambiar con el Servicio Cántabro de Salud ,y especialmente con el Ifimav, todo su potencial de investigación. - De los proyectos que tienen vigentes actualmente, ¿cuáles destacaría? - Desde el punto de vista de investigación básica, y citando sólo algunos que están generando resultados de gran impacto internacional, los estudios sobre las bases moleculares del cáncer, que han permitido identificar posibles nuevas dianas para su tratamiento, los mecanismos que determinan la capacidad infectiva de algunas bacterias, como es el caso de la brucelosis, los avances sobre cómo las bacterias se hacen resistentes a los antibióticos, los cambios cerebrales de los enfermos deprimidos o nuevos conocimientos relativos a la forma en que se desarrollan las extremidades. Además, acabamos de poner en marcha un potentísimo equipo de secuenciación que nos está permitiendo ya desarrollar estudios dirigidos a identificar los genes implicados en diversas enfermedades. Y junto a eso, tenemos varios proyectos de perfil mucho más aplicado, con frecuencia en colaboración con empresas: desarrollo de medicamentos anticancerosos, medicamentos para la depresión, desarrollo de biocombustibles, etc.